What would you do if you found $600,000 in unmarked bills? Would you turn it in to the police? Or would you claim ownership, as per the “Finder’s Keepers” Agreement? 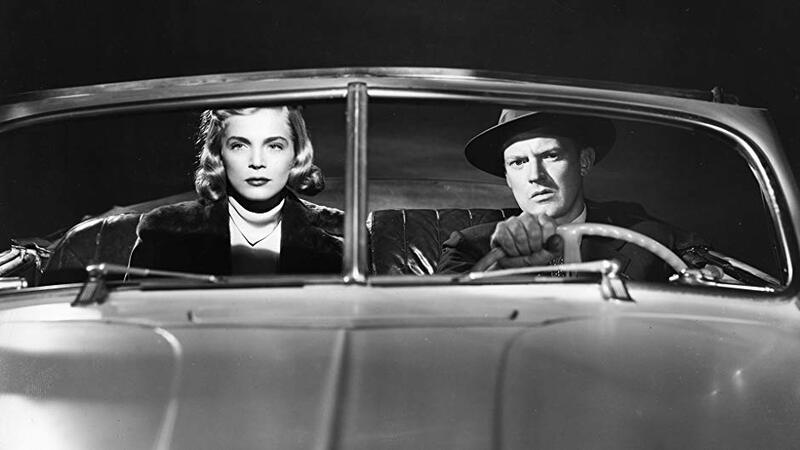 We were mulling over this unlikely event after re-watching the 1949 film noir, Too Late for Tears, starring Lizabeth Scott and Arthur Kennedy. The film examines What Happens when a couple receives an unexpected and illegal windfall – in this case, $60,000 cash (approx. $633,000 US today). Scott and Kennedy portray the married, but mismatched, couple. Kennedy is a respectable, middle class man with a nice car and nice apartment. He’s also a People Pleaser. Scott, on the other hand, doesn’t concern herself with the happiness of others. She’s the one who matters, Baby, and life ain’t giving her the riches she deserves. Look at how she complains about their friends, especially a “diamond-studded” woman who looks down on her. Kennedy humours Scott, and indulges her as much as he can. Why shouldn’t he? He’s in love with her and doesn’t see – or chooses to overlook – some of her aggressive tendencies. He’s in this relationship for the Long Haul. One night, as the couple travels down L.A.’s Mulholland Drive, a leather bag is tossed into the back of their convertible from a passing vehicle. They pull over and examine the contents. Immediately, Kennedy insists the money should be given to the police. But Scott has Other Ideas. Turn the money in?! Are you kidding? Let’s keep it and be Rich! But Kennedy will not be dissuaded. At least, that’s what he claims. So. When their car is pulled over a few moments later for a routine traffic violation, Kennedy doesn’t report the money to the policeman. In fact, he lies about who they are and where they’re going. Before we go any further, there are two things you should know. One: Arthur Kennedy was an exceptional film actor; he had five (5!) Oscar nominations to prove it. He was also a highly-respected Broadway actor, who appeared in the original productions of some notable Arthur Miller plays (e.g. The Crucible). He won a Tony Award in 1949 for his portrayal of Biff in Death of a Salesman. Two: Film noir is a cynical breed of film, usually involving a crime or other incident that Spirals out of Control. There are few saints in film noir; everyone is tainted to some degree. Plus, there’s often a dame who’s Trouble. So when a Respectable Man with a dissatisfied wife is thrown a bag full of money, it presents a perfect film noir crisis: The situation that can’t be contained. You see, deep down, this man wants the money – really wants it – but doing the Right Thing is important. It’s Who He Is. Kennedy the actor gives us an excellent portrayal of a man wrestling his conscience, and losing. Every time he objects to the money, Scott has a better reason for keeping it. She’s clever and persistent, and the only way he can buy some time (read: peace) is to try to outmaneuver her. Frankly, the role of the husband is one that could be sloughed off by a lesser actor and the film would still work. But Kennedy isn’t that kind of actor. Look at the way he clutches the bag of cash, as though he’s carrying his own death warrant. And when he and Scott empty the bag in their apartment, he gazes at the money with a mix of fear and wonder, and nearly becomes hysterical when someone knocks on the apartment door. It’s a big decision, what to do with all this money. Ultimately, the decision is made for him, and when it is, we feel a genuine pang of loss. Too Late for Tears has a more complex plot than we’ve outlined here. But we don’t want to give too much away. It’s a film you simply must see. When you do watch it, note the superb casting – especially Arthur Kennedy’s portrayal of a man facing the most expensive crisis of his life. 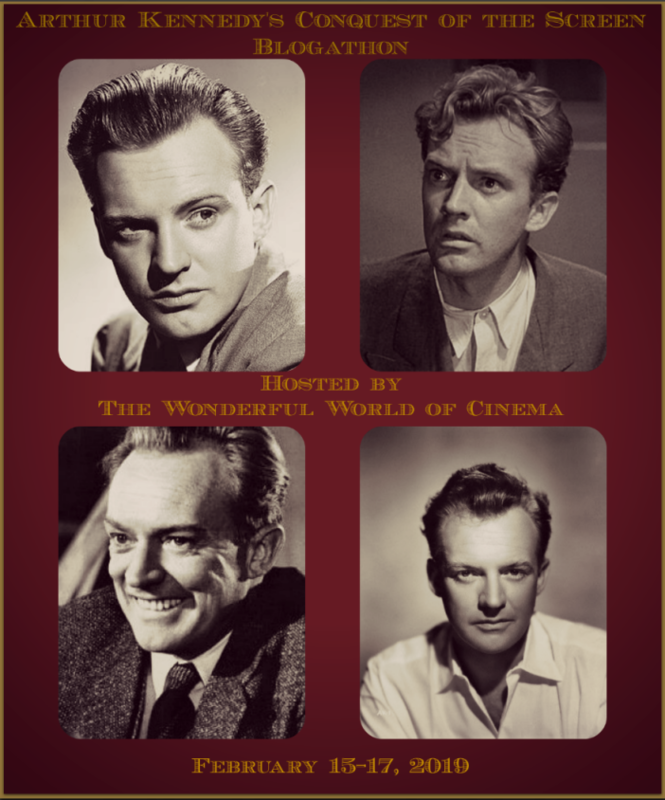 This post is part of the ARTHUR KENNEDY’S CONQUEST OF THE SCREEN BLOGATHON hosted by The Wonderful World of Cinema. Too Late for Tears: starring Lizabeth Scott, Don DeFore, Dan Duryea. Directed by Byron Haskin. Written by Roy Huggins. Republic Studios, 1949, B&W, 99 mins. I love old movies and your well-written post makes me want to check this one out! Oh, this is one you HAVE to see! It keeps you guessing until the end. I think there’s a semi-decent copy on YouTube. I would have loved to have him in those plays! Sounds a great film. Thanks for sharing. Wouldn’t it have been great to see Arthur Kennedy in the first staging of an Arthur Miller play? What an experience that would have been. Seriously, thanks for the reminder. One tends to forget Kennedy’s role alongside Scott and Duryea. Haha! Yes, Elizabeth Scott and Dan Duryea steal the movie, but I think Arthur Kennedy gives a superb performance, too. Well, what does that say about me, eh! I had forgotten that Roy Huggins wrote this intriguing story. I had not forgotten Arthur Kennedy’s work. He is not an actor one forgets. 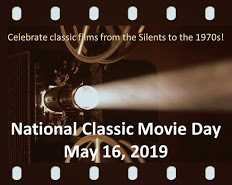 Great article and great choice for the blogathon. Roy Huggins had an impressive resume, didn’t he? Sounds like a film I’d enjoy – the title instantly pulls you in too. I do love a film noir – great write up! Thanks! You must, MUST see this film. It packs a lot of twists into a short run time, plus the acting is terrific. This has got me thinking: what would I do if I found that amount of money in umarked bills? I’ve got to be honest and say that I would be tempted to keep it at first (because mortgage payments, hel-lo! ), but after about 5 minutes I know I’d call the police and turn it in. There’s no way I could go on living the rest of my life knowing that I took $600k from someone who may have lost it. I’m way too much of a softie. It’s nice that you focus on Arthur Kennedy, one of the most underrated actors ever. So often he had to go up against acting heavyweights and he still made his presence felt. We have Scott and Duryea in this movie, it would be easy to overlook Kennedy. I’m probably guilty of that. That being said, Too Late For Tears is one of the best Noirs out there. You’re right – it is easy to overlook Arthur Kennedy in this film. But he holds his own against power hitters like Lizabeth Scott and Dan Duryea. Great post, and what a dilemma! You make me want to get this film now to find out how it all unravels. I especially liked where you said: ‘…a man wrestling his conscience, and losing. Every time he objects to the money, Scott has a better reason for keeping it.’ I feel like if this happened to me, I reckon that, circumstances considered, I might be both excitedly coming up with reasons and frantically shutting down reasons. I reckon I’d be shellshocked at the find — and maybe losing some sleep over it, haha. Bits of grey and hesitation, rather than a completely black or white way of going about the decision methinks! Awesome write-up, Silver. I hope you get the chance to see this film. It’s one of the best examples of film noir, in my opinion, and I guarantee you will not see the ending coming. Lizabeth Scott was marvelous…I loved her voice. So, it’s easy to see why her character’s husband would do all this! Just joking, of course, but TWO LATE FOR TEARS is an interesting noir and both leads are strong. I always think it’s a shame Arthur Kennedy didn’t get a little more screen time in this film, but I also admire its efficient script. As for Lizabeth Scott, I think she steals the whole film. She’s utterly fab. Excellent article Ruth! I love your dynamic writing style and I hope it will convice those who haven’t to see this film! I watched it not a long time ago for Noirvember and quite enjoyed it! Thanks so much for your participation to the blogathon! I bought a box set of 12 film noir movies over 10 years ago that had this on it. But I only got around to watching it a couple of weeks ago for this bogathon. I missed out. It’s damn good. I’ve done that sort of things lots of times myself. But you’ve seen the film now, happily! What a wonderful review! You did justice to the film, one that amazed and surprised me. I must confess that my eyes were glued on Lizabeth Scott, so next time I watch Too Late For Tears I’ll pay more attentio to Arthur Kennedy. Lizabeth Scott is utterly mesmerizing in this film, and it’s hard to notice anyone else in the room, isn’t it? But I think Arthur Kennedy brings a lot to his small role. Damn… I should probably watch this again!